Here is the answer: For good measure, I added some canopy struts to one of the QRF Bedford QLBs that had been assembled earlier. Now it is just crying out for a couple of scruffy gunners lounging in the back. As the Maultiers came rolling out of the box, it was clear that eight chassis could be assembled from all the extra options in the box. All that was absent were four sets of tracks. An hour with some Evostick resolved that, and the production line continued to roll in an ersatz German WW2 sort of way: Close enough for wargaming work! The work of dressing the bare chassis has begun with cam nets and crew. PSC provide plenty of figures and happily, most of these are closer to 15mm than 20mm. It is possible to score the sides of the late war anti tank mount, fold them up and make extra cargo bodies using the late war cab, if you do not want self-propelled guns. 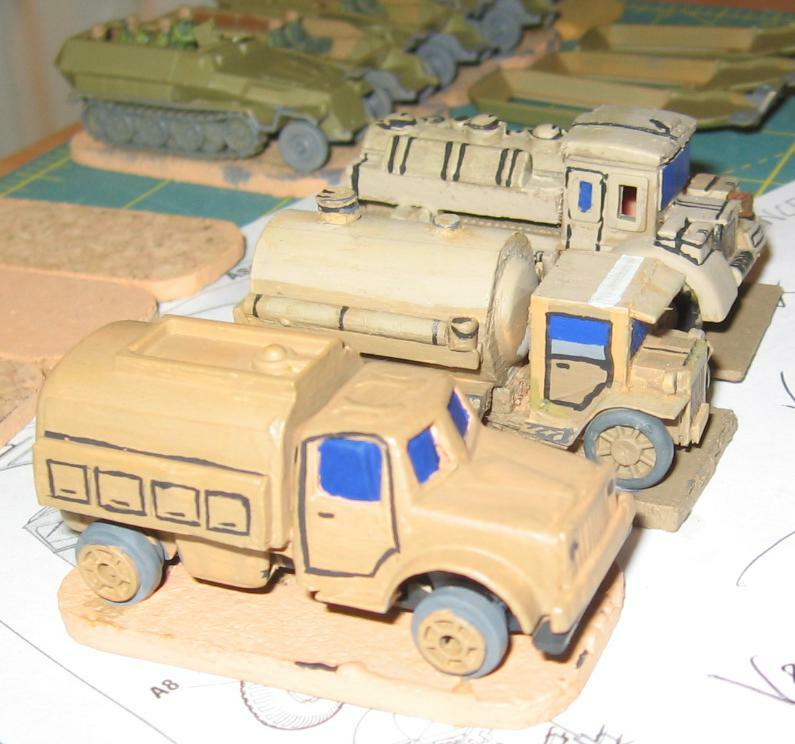 The new Plastic Soldier Company German Medium Trucks box is an excellent offering – Five easy to build trucks straight out of the box, with options for an Opel Blitz, Mercedes L3000, or Maultier version of either. 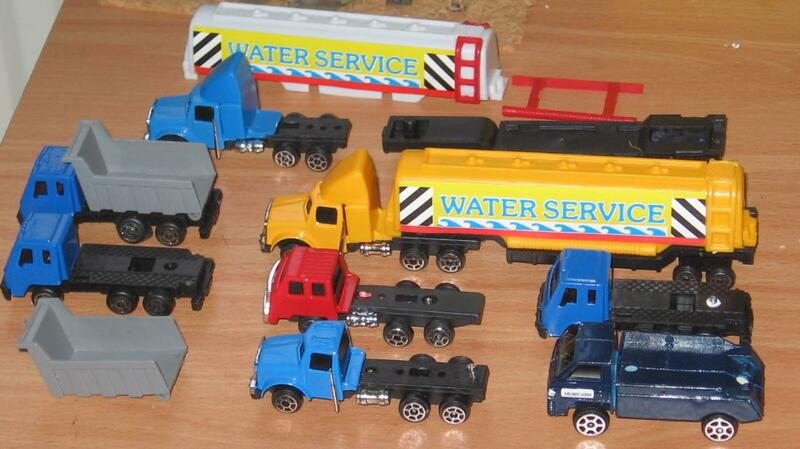 Five trucks for £17 pounds or so, roughly £3.40 a truck. Why do I like plastic kits better than resin or metal? They build up into square models, and they are easy to convert. So looking at the sprues more carefully, there are not five trucks in the box, but ten! All that is absent, are five cab backs that cannot easily be seen, five sets of front wheels and five chasses. Any self-respecting bodger will have spare wheels in the spares box. The card from the box itself, with judicious use of cork or plasticard will do the rest. Call it £1.70 per truck – excellent! Even after giving a sprue away, I rapidly assembled four Blitzes and four L3000s, making half of them into Maultiers. I was looking for photographic evidence of Maultiers in North Africa, but could only find them in Italy. Each sprue comes with a spare tyre, so these were made up into two sets of wheels for two of the trucks. En masse, any slight inaccuracies in the wheels should disappear. In case anyone is wondering, The four trucks furthest away are complete kit builds and the Maultiers closest to the camera are the bodges. Soaring off into speculation, I think that PSC missed a trick by not offering the Chevrolet cab and the office body on the box art; after all, everyone does a model of a Blitz. 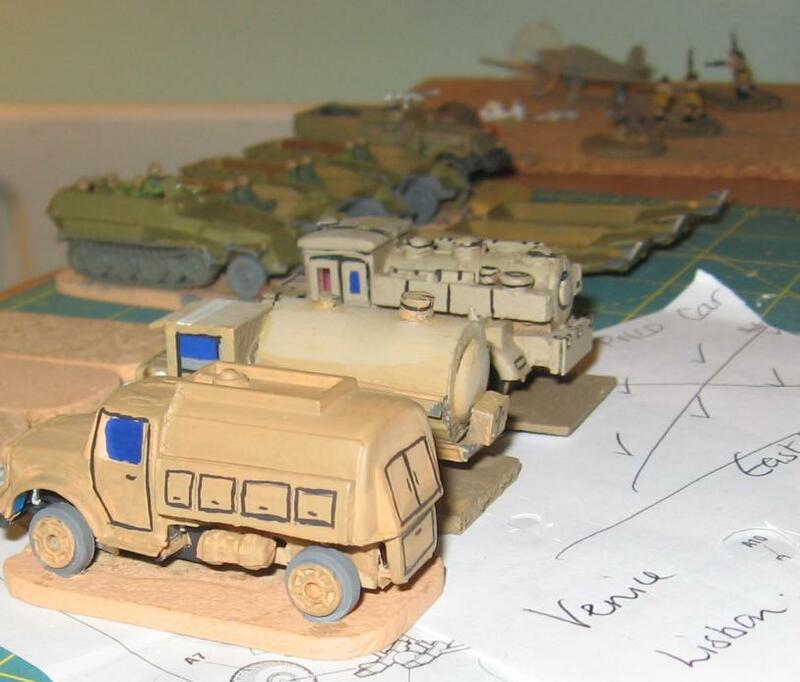 I would have preferred the office body, rather than another cargo body version, but I suspect most wargamers don’t want as many logistic or HQ vehicles as me. Either way, the box is excellent value and is recommended. This is one of the better models that arrived in my sale order. It is an impressive chunk of metal for £4.50 and all the castings are clean, relatively square and free of miscasts. The late war Einheitsfahrerhaus version is modelled. 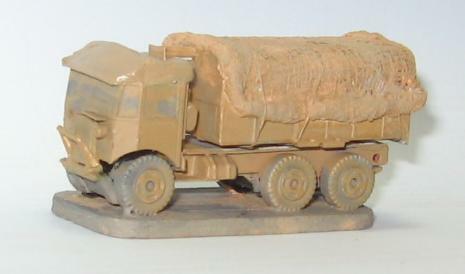 Some 1,500 of these were built, in response to delays in the Schwere Wermachts Schlepper programme; most were used as artillery tractors or platforms for Flak. As is usual with QRF; the track casting is double sided with no lugs to give a positive fit to the vehicle. The front wheel axle is a vague approximation of the real thing – I had a look at a few online images of L4500R chasses and still was not entirely sure which way the casting should be stuck on. I’m not complaining as you can hardly see it on the finished article. All in all, a nice wargames model that I haven’t been able to find elsewhere. … so given that it appears to be a faithful cast of the old Denzil Skinner diecast, is it the right size? Wickepedia gives 4.489m long for the Quad, and the casting is 45mm … spot on, which makes the FoW resin cast too small at 38mm. The visual difference is bigger than the dimensions suggest. We have seen this sort of thing before, with the FoW SdKfz7 actually being a 6, and being just short enough to fit onto one of their standard bases. Either way, It is jolly annoying. I assume that TSS bought the rights to the old Denzil Skinner moulds. If so then I can recommend this excellent, clean, square old casting with minimal flash at £3 as the best of the bunch; except that if you already have a fleet of smaller Quads, they won’t fit in. This kit would work well with a 25 pdr and limber, as it has no limber of its own. I was not aware that Quads were used to tow 6pdrs, but the photo below shows that this was the case. 6-pdr anti-tank guns towed by ‘Quad’ artillery tractors, 5 December 1942. Will McNally over at Will’s Wargaming Blog has found another anonymous Quad casting that at first sight appears to be a chop job from the Denzil Skinner casting; it is always hard to tell from photos. I made this model some time ago, was happy with it, and ordered another one. £4.50 buys you a large chunk of metal that looks like what it is supposed to be. My usual quibbles include wobbly wheels and nothing quite square, but they are part of the furniture for small batch metal castings that were hand-whittled by the sculptor . I’m pretty happy that someone makes a QLR, and at a very reasonable price too. See what I mean about nothing quite square? Trawling through pictures on the net produced lots of QLRs in Micky Mouse camouflage from France, post D-Day, but nothing to indicate they made it out to 8th Army, unlike the QLBs and Ds. The only photo that I have found to date is a restoration project with no provenance from the site. Morris CS8s are more in evidence, but I find it surprising that there are almost no pictures of signallers posing in front of office or radio bodied trucks. You cannot move on the net for pictures of tankies lounging around their mounts. Allied Signallers are obviously a shyer breed. Other likely vehicles are Austin K2, K3s, and Fordson WOT-2Ds, but again, photos of them are rare to non-existent. As ever, in the absence of evidence, I am making it up as I go along, based on what I can get. If you have a TO&E lying around for HQs in the Western Desert, or if you know of any contempory photographs, I would be very grateful for pointers. Quick Reaction Force held a 15% Sale over Salute 2016. I wanted some of their logistic and command vehicles, so it was a good time to purchase. I have ordered QRF before and found their castings to be challenging to assemble, so what were the latest crop like? This proved to be an older mould, needing a lot of cleaning up to obtain a presentable model. At £3.50 it is still excellent value for a metal kit if you are prepared to put the work in. Again, no-one else makes a model of it, so recommended if you have an hour to spare and are handy with a Dremel, metal file and set square. 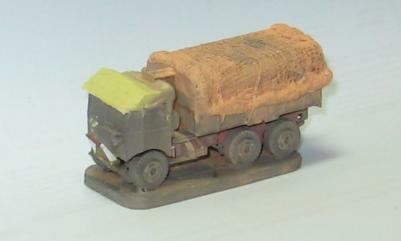 The catalogue picture cunningly does not show the cab front windscreen, which had a lot of gritty flash on my example. My painting has cunningly disguised it too. It is a heavy undercut. The picture does show the irritating mould lines that clean off reasonably easily. The wobbly wheels need resetting again. Drybrushing simply highlights any flash that has been missed in the clean-up. Recommended , with minor caveats. As aircraft fly in to the NQM boxes, they need ground crew to keep them in the air. My last purchase of Skytrex Italians left me with a fair number of spare figures, even after building a couple of infantry divisions. I could find very little by way of original pictures of Italian or Soviet ground support equipment- generator trailers and the like – so it left me a free hand to improvise with the central part of an Airfix 8.8cm Flak bogie in 20mm scale. A couple of spare wheels glued on was all it took. The Italians fared better with a couple of bicycles and some 1/300th scale signal bodies doubling as generators. Finally, a couple of figures chopped off at the legs provided a dug-in security detachment. Here they are with slightly more than an undercoat on them. Last week has been spent filing and chopping Phil’s articulated Poundland tanker to make something that looks vaguely like a WWII 3-ton tanker. It looks a bit like a Chevvy or a Dodge, so the Desert Airforce gets this one. I reckon that there are at least three more tanker bodies to be had out of the two semitrailer mouldings. The weakest part of the toy is the hotwheel, so I may yet add some better wheels if I can find a cost-effective source, or the patience to mould some out of Milliput. For now though, the conversion is passable enough to go onto the table. The background shows all the Sdkfz 251s needed for DAK. Yes, that’s four! I already have 4 metal models, but they are on grassy bases and the Plastic Soldier Company offerings are too good to resist. 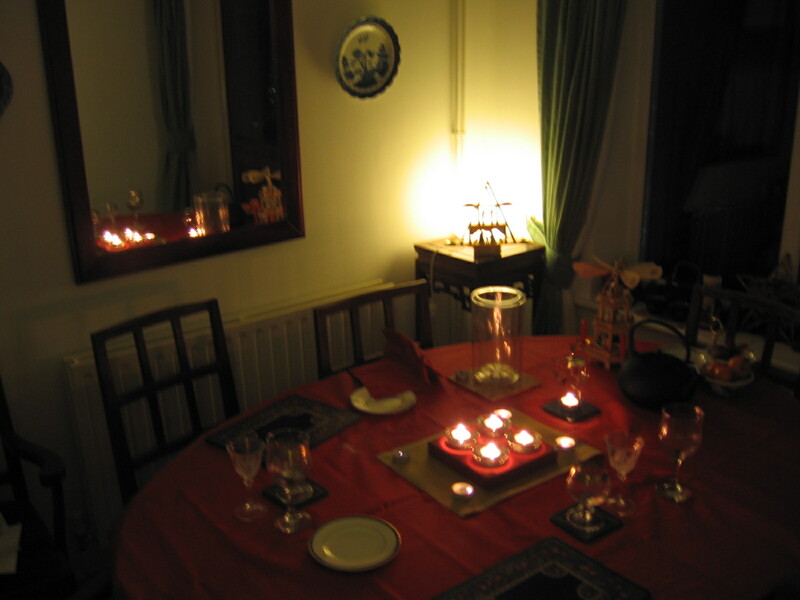 The festive season was rounded off in style with a duck dinner. Yes That Phil came round with a very decent bottle of Chateaux Margaux ’86, to show off his Pound Shop treasures, and he had a few spare. As it happened, I had a spare Matador to offer in return, so over Port and cheese, when it became permissible to talk wargaming, we sat and happily pushed the trucks around the tabletop as Phil outlined his 2013 plans for Megablitz Squared. Suzanne wandered off at this point to read her new book about the Dunkirk evacuation – Military Truckfests are not her thing. Here is the treasure fleet! Sporting a new quiff and nose bar, the Leyland Retriever continues to take shape. Bar a few coats of paint, the Retriever is just about finished now, Cheers Arthur! Retrieving an SPA Dovunque 35 (for scale comparison). Yes it is a big truck!